The Ro mam have about 230 people inhabiting in Le village, Mo Rai commune. Sa Thay district of Kon Tum province. 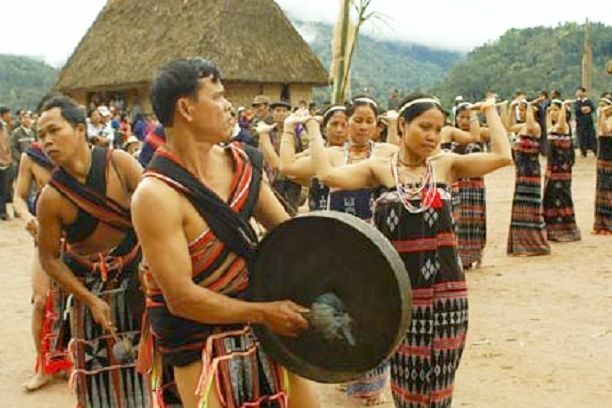 Ro mam language belongs to the Mon-Khmer Group. The Ro mam live mainly from cultivation on burnt-over land. Sticky rice is their staple food. Cultivation techniques are traditionally done, men dig holes by two sticks and women go behind them to put seeds into the holes and cover them with soil. Hunting and gathering play a fairly important role in their economic life. Among extra occupations, weaving was most developed but it has declined now, because the Ro-mam used to buy industrial goods sold in the market. Ro mam women used to wear jupes and shins with short sleeves. 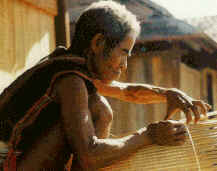 The jupes are made from coarse cloth without decoration and fall down below their knees. Men wear loincloths, front lap hang over their knees and back lap fall down to their shins. According to old custom, young people have tour to six of their upper teeth filed for aesthetic reasons. Nowadays, they do not follow this practice. Women like to wear earrings, bracelets and necklaces made from glass beads. The village of the Ro-mam is called a de headed by an old chief who enjoys the trust of all the villagers. 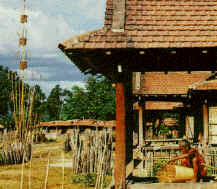 The Le village now comprises only about 10 houses and a rong (communal house). Each family comprises 10-20 persons of various generations who have blood ties. The couples live under the same roof, but each nuclear family forms its own economic unit. Each house has a corridor running the length of the house. The central part of the house serves as a reception area for guests and a place for common entertainments of all nuclear families.